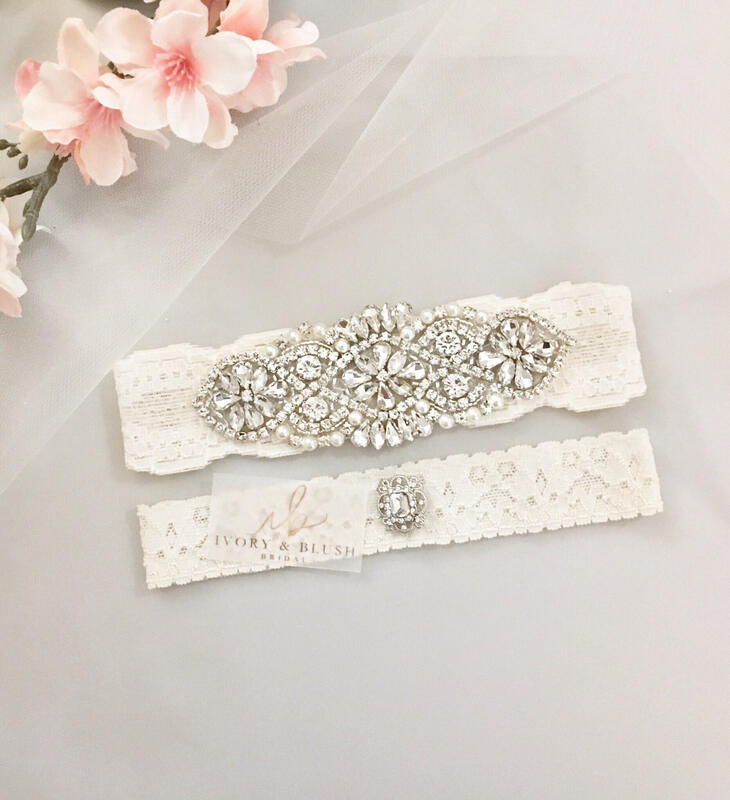 CUSTOM ACCESSORIES HANDMADE WITH LOVE BY A BRIDE JUST LIKE YOU! I got married not too long ago so I know what it feels like to be in your shoes. I always try to give the same care and attention that I would've wanted for my own wedding! I would be honored to make something for your big day! QUALITY HANDMADE GARTERS TAILORED TO FIT YOU! Not all garters are made the same! Garters with rhinestones and crystals can be a little heavy. Other brands only use ONE LAYER of thin lace for their keepsake garters that may not stay in place. All my keepsake garters have TWO LAYERS. Under each keepsake garter, there is an extra layer of elastic organza lace to make sure the garter stays in place! 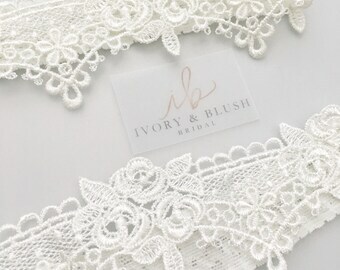 That way, you can have the look of delicate lace but the secure feel that you need! WHEN WILL I RECEIVE MY GARTER? - Processing time does not include shipping time. - Please see individual listings for processing times. - This means I will make your garter in 1 business day! - I place your garter in the mail the following day! - This listing only affects processing and not shipping times. - Follow this link and add it to your cart along with the garter of your choice! - It is very important to measure your leg while standing to make sure it fits when you walk around. Note: There may be a slight variation in color between the toss and keepsake garter due to the different sources of lace. - Since many of my items are made to order, I do not accept full returns, ONLY EXCHANGES. - However, if there is any problem with your order I will gladly do what I can to help. WHAT IF MY GARTER DOESN'T FIT??? - I feel confident that you'll love your purchase. - All garters are measured carefully and adjusted to ensure the proper fit. - In case you're not completely happy, you can return it within 14 days of your purchase so I can make any necessary changes. - Once I receive your return garter, I will adjust the size within 5 business days. - I can often fix your garter that same day. - Once in the mail, it will take 2-5 days to get back to you. However, I will personally pay to ship the garter back to you once fixed. Even more beautiful in person! You can tell the shop puts thought into each order and it was literally the most beautiful packaging I’ve ever received. The shop was very responsive and helpful to any questions I had! Stunning! I can't wait to wear it on my wedding day! My wedding is coming up soon! Do you offer rush shipping/processing? Yes! When you place your order, just add the 1-day processing fee to your cart along with your item. THIS MEANS I WILL MAKE YOUR GARTER IN ONE DAY AND PUT IT IN THE MAIL THE NEXT DAY. Your order will ship by the next day and once it ships (USPS First Class) it will take 2-5 business to reach you (in the US). NEED IT EVEN FASTER SHIPPING? Simply select a faster shipping at time of checkout. 1-3 Day Express and 1-2 Day Express Priority shipping available! What if my garter doesn't fit? We feel confident that you'll love your purchase. All garters are measured carefully and adjusted to ensure the proper fit. In case you're not completely happy, you can return it within 14 days of your purchase so I can make any necessary changes. Simply include a copy of your packing slip with your return and mail it back to my address on your order. Once I receive your return garter, I will adjust the size within 5 business days. I can often fix your garter that same day. Once in the mail, it will take 2-5 days to get back to you. All returns include an email with tracking. All customers are responsible for the cost of return shipping back to the seller. I will personally pay to ship the garter back to you once fixed. I have a question! When will I get a response? I am happy to answer any questions you might have! No matter how big or small, just send me a message! I will be more than happy to help. You will get a response within 24hrs!